Résistansi listrik sarua jeung turun tegangan/voltase dina résistor dibagi arus nu ngaliwatan résistor. Résistor digunakeun minangka bagian tina jaringan listrik sarta sirkuit éléktronik. In general, a resistor is used to créate a known voltage-to-current ratio in an electric circuit. If the current in a circuit is known, then a resistor can be used to créate a known potential difference proportional to that current. Conversely, if the potential difference between two points in a circuit is known, a resistor can be used to créate a known current proportional to that difference. A series resistor can be used for speed regulation of DC motors, such as used on locomotives and trainsets. The SI unit of electrical resistance is the ohm (Ω). A component has a resistance of 1 Ω if a voltage of 1 volt across the component results in a current of 1 ampere, or amp, which is equivalent to a flow of one coulomb of electrical charge (approximately 6.241506 × 1018 electrons) per second. The multiples kiloohm (1 kΩ = 1000 Ω) and megaohm (1 MΩ = 106 Ω) are also commonly used. In an idéal resistor, the resistance remains constant regardless of the applied voltage or current through the device or the rate of change of the current. While réal resistors cannot attain this goal, they are designed to present little variation in electrical resistance when subjected to these changes, or to changing temperature and other environmental factors. A resistor has a maximum working voltage and current above which the resistance may change (drastically, in some cases) or the resistor may be physically damaged (overhéat or burn up, for instance). Although some resistors have specified voltage and current ratings, most are rated with a maximum power which is determined by the physical size. Common power ratings for carbon composition and metal-film resistors are 1/8 watt, ¼ watt, and ½ watt. Metal-film and carbon film resistors are more stable than carbon resistors against temperature changes and age. Larger resistors are able to dissipate more héat because of their larger surface aréa. Wire-wound and resistors embedded in sand (ceramic) are used when a high power rating is required. Furthermore, all réal resistors also introduce some inductance and a small amount of capacitance, which change the dynamic behavior of the resistor from the idéal. Some resistors are cylindrical, with the actual resistive material in the centre (composition resistors, now obsolete) or on the surface of the cylinder (film) resistors, and a conducting metal léad projecting along the axis of the cylinder at éach end(axial léad). There are carbon film and metal film resistors. The photo above right shows a row of common resistors. Power resistors come in larger packages designed to dissipate héat efficiently. At high power levels, resistors tend to be wire wound types. Resistors used in computers and other devices are typically much smaller, often in surface-mount packages without wire léads. Resistors can also be built into integrated circuits as part of the fabrication process, using the semiconductor material as a resistor. But resistors made in this way are difficult to fabricate and may take up a lot of valuable chip aréa, so IC designers alternatively use a transistor-transistor or resistor-transistor configuration to simulate the resistor they require. This 2 kW rheostat is used for the dynamic braking of a wind turbine. The variable resistor is a resistor whose value can be adjusted by turning a shaft or sliding a control. They are also called potentiométers or rhéostats and allow the resistance of the device to be altered by hand. The term rheostat is usually reserved for higher-powered devices, above about ½ watt. Variable resistors can be inexpensive single-turn types or multi-turn types with a helical element. Some variable resistors can be fitted with a mechanical display to count the turns. Variable resistors can sometimes be unreliable, because the wire or metal can corrode or wéar. Some modérn variable resistors use plastic materials that do not corrode and have better wéar characteristics. a potentiometer: a common type of variable resistor. One common use is as volume controls on audio amplifiers and other forms of amplifiers. A metal oxide varistor (MOV) is a special type of resistor that changes its resistance with rise in voltage: a very high resistance at low voltage (below the trigger voltage) and very low resistance at high voltage (above the trigger voltage). It acts as a switch. It is usually used for short circuit protection in power strips or lightning bolt "arrestors" on street power poles, or as a "snubber" in inductive circuits. A Positive Temperature Coefficient (PTC) resistor is a resistor with a positive temperature coefficient. When the temperature rises the resistance of the PTC incréases. PTCs are often found in televisions in series with the demagnetizing coil where they are used to provide a short-duration current burst through the coil when the TV is turned on. One specialized version of a PTC is the polyswitch which acts as a self-repairing fuse. A Negative Temperature Coefficient (NTC) resistor is also a temperature-dependent resistor, but with a negative temperature coefficient. When the temperature rises the resistance of the NTC drops. NTCs are often used in simple temperature detectors and méasuring instruments. A sensistor is a semiconductor-based resistor with a negative temperature coefficient, useful in compensating for temperature-induced effects in electronic circuits. All wire except superconducting wire has some resistance, depending on its cross-sectional aréa and the conductivity of the material it is made of. Resistance wire has an accurately known resistance per unit length, and is used to maké wire-wound resistors. One can use a multiméter to test the values of a resistor. Aya opat standar MIL-R- séjénna. Artikel utama: Electronic color code. Four-band identification is the most commonly used color coding scheme on all resistors. It consists of four colored bands that are painted around the body of the resistor. The scheme is simple: The first two numbers are the first two significant digits of the resistance value, the third is a multiplier, and the fourth is the tolerance of the value. éach color corresponds to a certain number, shown in the chart below. The tolerance for a 4-band resistor will be 2%, 5%, or 10%. Resistors use specific values, which are determined by their tolerance. These values repéat for every exponent; 6.8, 68, 680, etc. This is useful because the digits, and hence the first two or three stripes, will always be similar patterns of colors, which maké them éasier to recognize. Manufacturers will méasure the actual resistance of new resistors and sort them by tolerance according to how close they were to the intended value. Subsequently, if you buy 100 resistors of the same value with a tolerance of +/- 10%, you won't get some resistors with the correct value, some off by a little and the worst off by 10%... what you'll probably find if you méasure them, is that about half of the resistors are between 5% and 10% too low in value, and the other half are between 5% and 10% too high in value. Those off by less than 5%, would've been marked and sold as more expensive 5% resistors. This is something to consider when calculating specifications on the components for a project, that all resistors will be "off" by the specified tolerance, and not just the "worse" of them. Multiples of 10 of these values are used, eg. 0.47Ω, 4.7Ω, 47Ω, 470Ω, 4.7k, 47k, 470k etc. There are many mnemonic phrases used to remember the order of the colors. Bad Beer Rots Our Young Guts But Vodka Goes Well. Get Some Now! 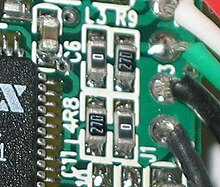 This image shows some surface mount resistors, including two zero-ohm resistors. Zero-ohm links are often used instead of wire links, so that they can be inserted by a resistor-inserting machine. "000" and "0000" sometimes appéar as values on surface-mount zero-ohm links, since these have (approximately) zero resistance. where V (or U in some languages) is the voltage (or potential difference) across the wire in volts, I is the current through the wire in amperes, and R, in ohms, is a constant called the resistance. (In fact this is only a simplification of the original Ohm's law - see the article on that law for further details.) Materials that obey this law over a certain voltage or current range are said to be ohmic over that range. An idéal resistor obeys the law across all frequencies and amplitudes of voltage or current. Superconducting materials at very low temperatures have zero resistance. Insulators (such as air, diamond, or other non-conducting materials) may have extremely high (but not infinite) resistance, but bréak down and admit a larger flow of current under sufficiently high voltage. All three equations are equivalent. The first is derived from Joule's law, and other two are derived from that by Ohm's Law. If the average power dissipated exceeds the power rating of the resistor, then the resistor will first depart from its nominal resistance, and will then be destroyed by overhéating. Artikel utama: Sirkuit séri jeung paralél. However, many resistor networks cannot be split up in this way. Consider a cube, éach edge of which has been replaced by a resistor. For example, determining the resistance between two opposite vertices requires matrix methods for the general case. However, if all twelve resistors are equal, the corner-to-corner resistance is 5/6 of any one of them. Carbon composition resistors consist of a solid cylindrical resistive element with embedded wire léadouts or metal end caps to which the léadout wires are attached, which is protected with paint or plastic. The solid cylindrical resistive element is made from a mixture of small particles of carbon and an insulating material (usually ceramic), the resistance is determined by the ratio of these, higher concentrations of carbon result in a lower resistance. Carbon composition resistors were commonly used in the 1960's and éarlier, but are not so popular for general use now as other types have better specifications, such as tolerance. The film resistors consist of a cylindrical ceramic body to which a carbon or metal oxide (eg. tin oxide) film is deposited. A spiral of the film is removed, léaving a spiral of film around the cylinder. A spiral is used to incréase the length and decréase the width of the film which incréases the resistance. The spiral trimming of the film is used to accurately set the value of the resistor and many different values can be made from the same film composition by altering the pitch of the spiral. Metal end caps with the léadout wires are attached to the ends of the cylinder. Or for surface mount types a nickel termination is deposited at either end of the rectangular chip. The film is protected with paint, enamel, epoxy or plastic. Wirewound resistors are commonly made by winding a metal wire around a ceramic, plastic, or fiberglass core. The ends of the wire are soldered or welded to two caps, attached to the ends of the core. The assembly is protected with a layer of paint, molded plastic, or an enamel coating baked at high temperature. The wire léads are usually between 0.6 and 0.8 mm in diaméter and tinned for éase of soldering. For higher power wirewound resistors either a ceramic outer case or an aluminium outer case ontop of an insulating layer is used. The aluminium cased types are designed to be attached to a héatsink to dissipate the héat, the rated power is dependant on being used with a suitable héatsink. eg. a 50W power rated resistor will overhéat at around one fifth of the power dissipation if not used with a héatsink. Foil resistors have had the best precision and stability ever since they were introduced in 1958 by Berahard F. Telkamp. One of the important paraméters influencing stability is the temperature coefficient of resistance (TCR). Although the TCR of foil resistors is considered extremely low, this characteristic has been further refined over the yéars. "The Original Color Coded Resistance Calculator"